Adorno's discussion of Kafka's geographical, or toponymic, affect identifies a complex instance of the modernist uncanny. His description of the 'shudder' experienced by the reader when Kafka's fiction - and, indeed, Kafkan fiction - inscribes itself into the spatial relationships of the (theoretically) non-literary is something I find to be surprisingly accurate: when, right towards its conclusion and in the form of K's Italian visitor, The Trial admits itself to geography's frame of reference, one can't help but feel a creeping sense of untowardness. Why? An explanation of the mechanics of the situation begins with reference to genre: what one responds to is a redrawing of textual regulations typical of real Fantasy; we're moved by a spontaneous-seeming alteration of what had appeared to have asserted its claim to be the organising linguistic perspective of the novel (that is, a linguistic perspective that can't see outside the hermetically-sealed 'spaceless space' of the Kafkan city). In synchronising ourselves with the The Trial's elaboration of an entirely immanent topography - its fundamental prozess -which permits no extensions into a social or historical megatext, we learn to forget to believe in the very possibility of these extensions. The ground of the writing is the writing itself, so when 'our' world smuggles itself back into the text it feels as if we've fallen through a trapdoor back to ourselves. That said, I don't think that Adorno's insinuation that the 'shudder' takes place because 'it' - Josef K's persecution; K's insinuation into the rhythm of deferral - is 'happening here' is entirely correct. We are generally sophisticated enough to perceive some sort of ontological difference between place-names in a work of fiction and place-names on the map, however open to problematisation this distinction might be; we're (mostly) aware before reading the novels that the mingling of inexplicable cruelty and officiousness that's the bare truth of Kafka's world is also characteristic of ours. The surprise, in other words, isn't the Planet of the Apes-style revelation that we were at home all along, but the disestablishment of a literary code which discreetly works as a metonym for the principle of ordering knowledge. The first, 'spaceless' code nominates literariness as what is stably separate, while its sudden citation of a geographically-informed (cultural) code repositions this separateness as a socially-necessary fantasy. It's only in the inversion of image of the stably literary or poetic achieved by its idiomatically-inapt citation of a culture not immanent to it that the work reclaims its autonomy as the space of social critique; that is, it's the shattering of the epistemology of 'spacelessness' it offers to the reader that maintains it as spaceless. NELL: It was on Lake Como. [Pause.] One April afternoon. [Pause.] Can you believe it? NELL: That we once went out rowing on Lake Como. The difference between Beckett and Kafka's attitude towards the geographic is that Endgame internalises the reader's disbelief at the intrusion of the toponym - never mind if Nagg can, are we able to 'believe' that this is a world in possession of a Lake Como? STANLEY. [...] I've played the piano all over the world. All over the country. (Pause.) I once gave a concert. STANLEY (reflectively). Yes. It was a good one too. They were all there that night. Every single one of them. It was a great success. Yes. A concert. At Lower Edmonton. Pinter's mechanism enjoys as subtle a difference from Beckett's as Beckett's does from Kafka's. While the spacelessness of The Trial is well-established by the time of Italian visitor's arrival, and Endgame - partially by dint of a paratextually-gained sense of how Beckett 'works' - seems to come off the map almost before it has begun, Pinter's disestablishment of the literary only works when this conversation is looked to retrospectively, after the ontologically-troubling arrival of Goldberg and McCann. Stanley and Meg's interchanges are certainly weird and disconcerting, but, paradoxically, the world of The Birthday Party only comes to seem hermetic after it has been violated. Blasted follows the example set by Pinter: the Soldier's intrusion into Ian's hotel bedroom establishes it as a hermetic, literary, space precisely because he arrives as a deserter from an unnamed war which bears the marks of allegory rather than historicity. The inspecificity of the historical rules of the outside - what is the 'organisation' than Goldberg and McCann work for, and why is there a war in Blasted? - insists that the precursors of these institutions and events are those things possessed by Kafka's notoriously vague definite articles. 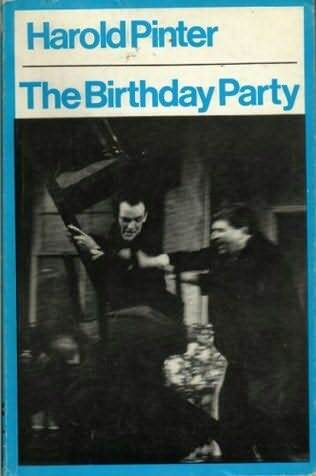 When audiences of The Birthday Party and Blasted realise that the terms were Kafkan all along, they shudder at the recollection of the plays' appeals for a naturalistic extension. When, in Kane's play, Ian and Cate debate the value of going to Elland Road to watch Leeds play on a Saturday afternoon, the dyke of the geographic text bursts: if there's a Lake Como there's a Maggiore, if there's a Lower Edmonton there's a Chingford, and if there's an Elland Road there's a Hillsborough. And yet it's these refusals of a particular kind of hermeticism which give them, via the fracture brought about by the citation, their truly antithetical status.